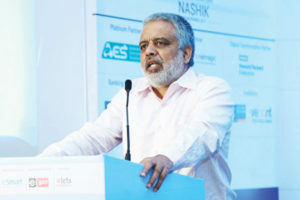 One of the major objectives of the State is to Supply reliable and quality power to all categories of consumers in an affordable manner, says Ajay Mishra, Special Chief Secretary, Department of Energy, Government of Telangana in conversation with Sudheer Goutham of Elets News Network (ENN). How has Telangana transformed from a power deficit State to now the first state in the country to supply 24x7 free power to agriculture? Since the formation of Telangana in the year 2014, it has been the vision of the Hon’ble Chief Minister Shri K Chandrashekar Rao to develop Hyderabad as a global city and Telangana as the best State in the country. Providing 24x7 free power supply to farmers and ensuring reliable and uninterrupted power supply to all the sectors in the State is a core component of the vision of the Chief Minister. The total contracted capacity of Telangana at the inception was 6,573 MW only. We inherited a power deficit scenario at the time of the formation of the State, load shedding for the domestic sector, power holidays for the industry sector and unreliable 6 to 7 hours of power supply to farmers were in vogue. Power generation in the State was short by 30 per cent as compared to the total demand at that point in time. However, after the formation of the state, the Government of Telangana has taken several measures to ensure 24X7 power availability to industry and domestic. We are the first state in the country to implement 24x7 free power supply to farmers. This was achieved by contracting sufficient quantities of power to overcome the power deficit scenario. Highest emphasis was placed on timely commissioning of generation plants which were under progress and also in the execution of works for construction of new generation plants. We have undertaken a massive capacity expansion plan for the next three years and that includes 5,880 MWs by Genco, 4,000 MWs by NTPC and 800 MWs by SCCL. What is the current position of Telangana in terms of Renewable Energy generation? One of the major objectives of the State is to supply reliable and quality power to all categories of consumers in an affordable manner. The Government of Telangana realised the need for development of renewable power projects and strengthened the State Nodal Agency for the promotion of renewable generation – TS REDCO. The State Government has announced progressive solar power policy which was well received by the industry. The policy has ease of doing business provisions and incentives for promotion of solar power in the state. Promotion of solar energy supports our vision of meeting the needs of farmers. The Energy Department in coordination with TS Discoms have been the pioneer in introducing distributed solar energy in the State. This model ensured generation of solar energy closer to the demand centres resulting in minimising of transmission losses and upstream network investments. Tenders were invited for solar power capacity of 500 MW in 2014 and 2,000 MW in 2015. Including the earlier procurement of solar power prior to 2014, the current installed capacity of solar power in the State is 3,204 MW. A solar capacity of 603 MW is under commissioning. Sustained efforts of the Energy Department and TS Discoms have enabled Telangana to establish itself as a leader in solar energy generation across India. Tell us about the implementation of 24x7 free power supply to farmers? The duration of power supply to agriculture was increased from 6 hours to 9 hours in 2016-17, keeping in view the energy requirement of farmers during August 2017, the Government has implemented 24x7 free power supply to agriculture sector in three districts, on a pilot basis. In November 2017, on a pilot basis, the government has implemented 24x7 free power supply to agriculture sector for the total state for 10 days. Now, from January 1, 2018 onwards, the 24x7 free power supply was successfully implemented in all the districts by commissioning of new power plants, expanding state transmission and distribution network, and commissioning of 765 KV inter-state transmission line by Power Grid Corporation. The State Government has conceptualised major Lift Irrigation schemes in the State. This requires substantial power requirement. Energy department in coordination with TS Genco has planned capacity additions to meet the energy requirements of agriculture, irrigation and growth from other categories. The above achievement was made possible on account of the vision, planning, support, and determination of the Chief Minister to ensure an uninterrupted 24x7 power supply to all the sectors and all-round development of the State. Under the guidance and support of the CM, the following could be achieved by TSGENCO & TSTRANSCO. TSTRANSCO is amongst the best performing transmission utilities across the country. The transmission losses of the state have come down from 4.3 per cent in April 2014-15 to 3.31 per cent in 2017-18 (till Dec 17). The overall T & D losses in the State of TS has come down from 16.24 per cent in FY 2014-15 to 14.29 per cent in FY 2016-17. Where does Telangana stand in India’s overall Power Vision? Telangana is one of the leading States in the Country in terms of providing 24x7 uninterrupted power supply to all sectors. It is pertinent to note that 24x7 power supply is one of the flagship programmes of the Government of India. As on date, very few States have achieved the benchmark of 100 per cent electrification of villages and it is a matter of pride that Telangana is one of such States. Going beyond the village electrification, 98 per cent households have been electrified so far and remaining are planned to be electrified by the end of 2018, which is again a flagship programme of Govt. of India. Telangana discoms has always been in the forefront in upgrading its infrastructure and usage of technology to provide reliable power supply to its consumers. There is no power shedding in Telangana right from the inception of the State. This improved power supply has led to many other benefits such as improvement in productivity for industrial consumers, and quality of life for all consumers in the state.